DACmini™ PX builds on where DACmini CX left off. PX stands for “Power eXperience” — it adds a power amplifier to our already popular, award-winning DAC product. 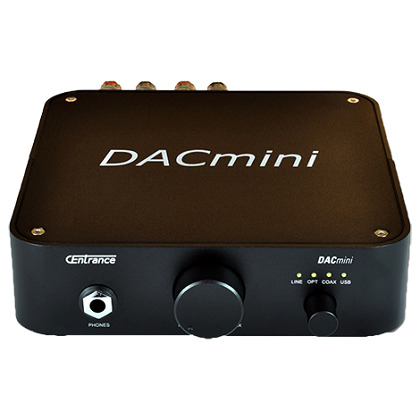 DACmini PX is three products in one: DAC, Headphone amp and Power amp, all packaged in a compact chassis that looks great on a desk or an equipment shelf. DACmini PX is an integrated amplifier that forms the basis of what we call the Audiophile Desktop – a mini system with elevated sound quality, offering hours of fatigue-free listening enjoyment. Featuring 192kHz/24-bit performance over SPDIF, 96kHz/24-bit over USB, an analog input, headphone and line-level outputs, and 25W per channel power output, DACmini PX is an extremely flexible device that can upgrade the sound quality of any audio system. It easily streams music from such sources as a Mac, Windows, music server, iPod/iPhone, Apple TV, Airport Express, Xbox 360, PlayStation 3, and Squeezebox, to name just a few, providing a variety of ways to create a digital audiophile playback system. DACmini PX is designed to be the centerpiece of your computer audio system. It returns the warmth to your digital audio without being obtrusive. Our customers describe DACmini’s sound as having “Transparent highs, tight bass, and clarity in the mid-range only found in products well above the $1000 price range.” DACmini is also a versatile home audio hub, featuring a line-level input for your portable music player, an S/PDIF input for your digital sources, a Class-A Headphone Amplifier that can drive virtually any headphones with lowest distortion and a power amplifier that works with the majority of bookshelf speakers. Placed near your computer monitor, DACmini PX becomes the core of your desktop audio setup. DACmini is styled to stack perfectly with an Apple Mac mini, making for an exceptional small-footprint music server. However, connectivity is not limited to the Mac. DACmini works with Windows and iPad just as well. Improving upon our successful DACport and featuring our amazing1 USB audio technology, DACmini is a perfect way to listen to High Definition music at home.